You have to work hard to attract attention on social media. With a little creative input, data can help you visualise your story and engage your audience. Everyone’s trying it out. Buffer conducted tests which revealed that their own posts received 150% more retweets when posting with images. Maps and slick infographics are widely used for complex information and may need a professional to create them. But simple illustrations can be straightforward to produce even with limited resources. 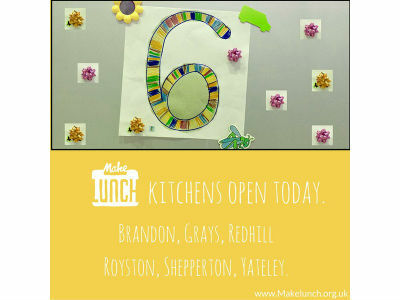 Last year, I started working with Make Lunch, a small charity which coordinates community kitchens to feed and entertain children in the holidays. They already actively use social media to share information about the number of kitchens open on particular days during the holidays. Previously, they used text and hashtags of the locations in their posts, but it wasn’t generating much engagement. We wanted to see if we could bring the numbers to life, so together we produced a series of graphics. Here are the lessons we learnt along the way. What are the key pieces of information you want to bring to life? You may have some juicy stats from your latest campaign, want to celebrate fundraising totals, thank campaign supporters or simply illustrate numbers which support your core mission. How does your brand work on social media? How formal are you? Do all your graphics have to follow your corporate style or can they look a little home-made? Does your audience respond to a particular style? Social media can give you the freedom to be creative, but think about what is appropriate within your tone of voice and your cause. For Make Lunch, we played around with using food to make up numbers. We wanted eye-catching graphics to make our numbers stand out. But we soon found it was hard (and boring) to try and make baked beans and raisins line up neatly to look like a number '8'! In the end we got better results with Christmas decorations, number drawings done by my children and some wooden numbers we borrowed from school. The images reflected the fun, informality and child-focused nature of the work done by Make Lunch. Top tip: accessibility – remember that not everyone will be able to see your graphic. Include the data in the tweet or post in full or as a text summary with a link. Do you already have graphics from a print campaign you could use? Or someone in the team with lovely handwriting or drawing skills? Maybe you have other creative props lying around such as Lego or magnetic letters which could be used. Check whether there are any copyright issues. If you don’t have any assets, online tools such as Canva can work really well. Top tip: your source – check and reference the source for your statistics and third party graphics. Also think carefully about sharing sensitive data about live events. Get permissions or preserve anonymity where appropriate. You’ll need a room with strong light and no shadows. Or an outside space on a bright day. Keep things clean and use straight lines. Specs of dirt and funny angles can be distracting. Strong colours can work well as a background. Use your smartphone to take photos of your creations. Review as you go. Make them look better using photo editing software. Top tip: check your sizes – use this size guide from Sprout Social. Think about what numbers or graphics you might need in the future. Build a collection of images you can use again and again. Save the originals. It was a time-consuming process to try different styles but we learnt lots along the way. The graphics were eventually used alongside photos from kitchens in action over the Christmas holiday. They got very few likes or shares on Twitter but a reasonable number on Facebook. As data, the number of kitchens open isn’t necessarily very shareable. Our goal was to celebrate the work being done across the country and to inspire others to join in. We ran out of time to prepare more detailed information to support the graphics so the posts didn’t have links in them. As a result we don’t have any data about how effective they were at achieving this goal, but it's definitely something to remember next time we try this. Top tip: links – include a link so people can read more or take some action. For more examples of how different charities are using graphics, check out my blog on creative ways to illustrate data and stats on social media.